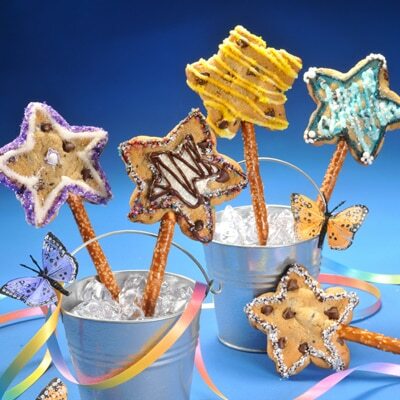 Just as delicious as they are enchanting, these magical cookie wands will make any child feel like a skilled wizard. Using our refrigerated chocolate chip bar dough, cookies are cut into star shapes and added to a pretzel rod as an easy and fun family activity. For a final, sparkling touch, top the wands with a variety of decorator gels and sprinkles. BREAK dough apart cookie dough into medium bowl. Combine dough and flour until mixed. Roll cookie dough to 1/4-inch thickness between two sheets of floured wax paper. Remove top piece of paper. Cut cookie dough into stars with cutter. Transfer stars to baking sheet placing about 4 inches apart (2 to 3 baking sheets will be needed, pending size of sheet- stars will spread). Place pretzel rod under star (make sure to have rod at least to middle of star or close to top). Press down lightly. Refrigerate for 15 minutes. BAKE for 13 to 14 minutes or until lightly browned. Remove from oven and immediately pat sides of each star with edge of knife to help retain shape. Cool on baking sheets for 5 minutes; remove to wire racks to cool completely. MICROWAVE morsels on MEDIUM-HIGH (70%) power for 30 seconds in small, heavy-duty plastic bag; knead. Microwave at additional 10- to 15-second intervals, kneading until smooth. Cut a small corner from bag. Squeeze bag to drizzle melted morsels over cookie stars in design desired. Immediately sprinkle with sugar or sprinkles. Let stand for 15 minutes to set drizzles.